Alexander Waugh’s library is shambolic and beautiful. The windows look out onto late autumn in Somerset, and the crackling fire next door scents everything with woodsmoke. A cat sleeps on a chair. I admire a special edition of Brideshead Revisited, which Alexander’s grandfather Evelyn had commissioned himself; like his grandson, Evelyn loved a well-crafted book and had bespoke runs of his novels printed on handmade papers and bound in embossed leather ready to give away to friends. Lady Diana Cooper, a regular beneficiary, spoke of her ‘shining row of Waugh books’. The first in these runs was always dedicated to Evelyn’s wife, Laura. Box files of letters, copied from Evelyn Waugh collections across the world, have also found their way into the library from the archive next door. They are stacked, sometimes upside-down, behind sofas and under tables. Alexander and I are not reading in the soft afternoon light. We are searching. One of these files has gone missing, an important one. 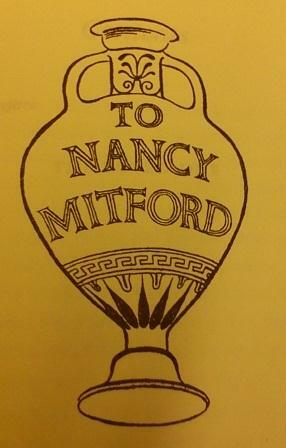 It contains copies of Nancy Mitford’s letters to Evelyn Waugh. 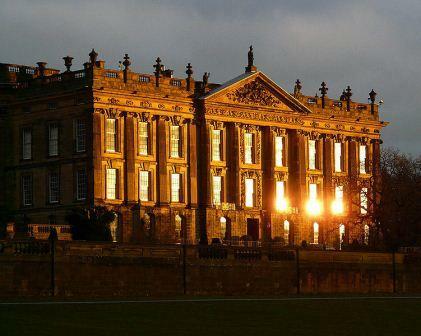 The originals are tucked away at Chatsworth House, which is closed while Charlotte Mosley completes another volume of Mitford letters. I tell Alexander that I’m sure I saw the file in the archive room yesterday. ‘Nancy!’ calls Alexander. ‘Where are you, Nancy’? 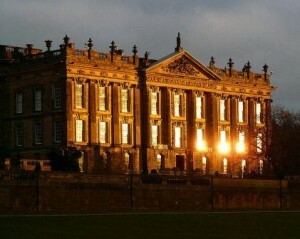 Chatsworth House, home of surviving Mitford sister the Duchess of Devonshire. That box file is crucial to our project, which is the reason I am here. Alexander is the General Editor of Oxford University Press’s new Complete Works of Evelyn Waugh, which will bring together all his grandfather’s published and unpublished writings for the first time. There will be 42 volumes in all, overseen by a team of more than twenty editors. Alexander is responsible for all the Personal Writings – letters and diaries, mostly – which will fill up twelve volumes on their own. Now, he is menaced by the idea of footnoting the 200-strong collection of Evelyn’s letters to Nancy, without Nancy’s 300 letters to him. A daunting prospect. Evelyn and Nancy were both what are commonly called ‘prolific letter-writers’ – not only that, but they wrote more to each other than almost anyone else. 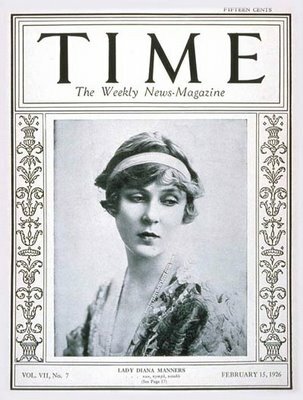 On Evelyn’s side there was Laura, of course, and Diana Cooper – Nancy’s friend too, and immortalised by both novelists as Mrs Stitch (Scoop and Men at Arms) and Lady Leone (Don’t Tell Alfred). Nancy wrote most to her sisters, two of whom Evelyn managed to fall in love with. Diana he knew before Nancy, when she was married to Bryan Guinness. Diana and Brian took Evelyn in after his bruising first marriage, and he based his second novel Vile Bodies on their adventures amongst the Bright Young Things. Debo, like many beautiful young aristocrats, he admired from afar. Nancy and Evelyn were rude about Jessica together – Nancy once remarked that a mutual acquaintance was ‘even worse than Decca’ with her children – and Evelyn detested Tom Mitford, though kept this from Nancy who would ‘always miss’ the brother she lost in the war ‘terribly’. Dedication page of Waugh’s ‘The Loved One’. I assume you wrote it with the intent to be odious. It would be just tolerable if you had always set up as a porcelain marquise advising the starving to eat more cake. But you were always lecturing us about how much you loved human kind and now with human misery & degradation everywhere at its blackest and you talk like a debutante after her first party. It is not that I think you soul in danger but that I doubt if you have a soul at all. I believe it is highly heretical of you to say that I have no soul – even abortions have souls. Nancy’s amused tolerance moved Evelyn to confide in her, and to tacitly thank her for not taking his barbs seriously. Over Christmas 1947, he received some damning reviews for his novella Scott-King’s Modern Europe. None of the reviews were actually about the book, Evelyn complained, but about him, ‘saying that I am ill-tempered and self-infatuated…Would you say I was a very ill-tempered and self-infatuated man?’ He asked. ‘It hurts’. Ill-tempered he certainly was, but not ‘self-infatuated’. Evelyn wrote tender letters to Nancy on the deaths of both her parents, read and responded to her work carefully, and thanked her with humility for the beautiful gifts she sent to Harriet, his fourth daughter and Nancy’s Goddaughter, from the relative luxury of post-war Paris. One of these was a little teapot, which Evelyn kept carefully wrapped and refused to let Hatty play with until Nancy insisted. It duly smashed. Lady Diana Cooper, another of Waugh’s favourite correspondents. I leave Somerset with The Mitford File still lost. Alexander and I are haunted by the shade of Diana Cooper: Lady Diana kept every letter Waugh sent her, only for a large chunk of them to end up somehow in the possession of a book and antiques dealer named Christopher Gange. They were bought back by Diana’s son, John Julius Norwich, but only after Diana herself had died. These letters, at least, are only copies – tools for the colossal editorial job that lies ahead. That’s why I’m leaving. I have work do to, beginning with the creation of an electronic database of all Waugh’s letters. I have two thousand, four hundred and twenty-three so far; the tip of a paper iceberg. It makes it easier and harder in equal measure that I keep stopping to read the letters rather than sort them, and giggling at a young Waugh’s determination to grow a moustache in recompense for his lack of new clothes or preoccupation with the family dog’s mange.An email arrives before I’m even home. In transpires that The Mitford File was never really lost, but not filed at all. A big wodge of paper was sitting, wrapped in brown manila, in a big plastic box of correspondence (M-Z) ready to take its place in the archive. I could have sworn I saw it there already, but apparently not. By now, though, it will have pride of place. 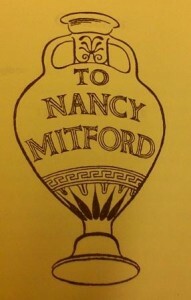 Sources: All quotations from Evelyn and Nancy’s letters are taken from Charlotte Mosley’s The Letters of Nancy Mitford and Evelyn Waugh. London: Penguin, 2010. The information regarding the missing Cooper letters is taken from the Introduction to Artemis Cooper’s Mr Wu and Mrs Stitch: the letters of Evelyn Waugh and Diana Cooper. London: Hodder & Stoughton, 1991. The quotation from Lady Cooper is also from this edition. Well, this is brilliantly written. I look forward to more reports from the frontier! Hi Barbara, This all sounds fascinating! I’m writing a dissertation for my final year assessment at the moment looking at Evelyn Waugh’s time at Oxford. Where is this Waugh archive? Would I be able to email you with some questions? Of course, ask away! I will email you my contact details. I’m afraid the EW archive isn’t open to the public but the best collection for Waugh’s Oxford years is the Bodleian Library. They’ve got fantastic stuff there.